Need Allergy Relief? Try Dr. Neuzil’s Irrigator! Ed Neuzil, board certified ARNP and Phd, who has had his own allergy, sinus and asthma practice in Central Florida for more than 12 years joins eHealth Radio and the Allergy Information Channel. He has also developed an herbal-enhanced nasal cleansing spray, Dr. Neuzil’s Irrigator that provides relief for dry, irritated nasal passages. Recently, a Centers for Disease Control report relayed even greater concern about overuse and improper use of antibiotics as potentially leading to Super Bugs or medication-resistant strains. What types of symptoms or conditions might you have previously prescribed antibiotics for? Which conditions might still be appropriate for antibiotic treatment? What alternatives do you prescribe for patients to get relief? You have developed a nasal irrigation solution called Dr. Neuzil’s Irrigator nasal spray. What does it do and how is it different from other nasal irrigation products? Where can you purchase Dr. Neuzil’s Irrigator? 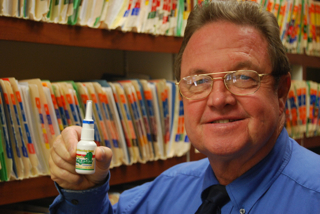 Francis "Ed" Neuzil, PhD, MSN, ARNP is the creator of Dr. Neuzil's Irrigator. He has over 34 years of experience in the medical field and is a Nurse Practitioner with 11 years of specialty expertise in the fields of allergy, sinus and asthma. He is the owner of the Allergy, Sinus and Asthma Family Health Center in Lady Lake, Florida and has five college degrees including his Ph.D. in Health Administration. He created the herbal-enhanced sinus rinse for his own family and patients who often suffer during Florida's extended allergy seasons. Dr. Neuzil's Irrigator is not a steroid or nasal decongestant. This nasal spray is a saline formula with light menthol, natural oils and herbs added so it doesn't burn, sting or leave an unpleasant aftertaste. It uses the natural decongesting effects of the essential oils to provide comfort and relief. Neuzil is an Associate member of the American College of Allergy, Asthma & Immunology and a member of several local, state and national professional organizations.